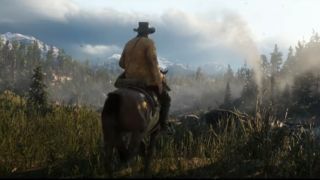 Rockstar promised brand new Red Dead Redemption news on September 28 and it delivered in a big way with the game’s second official trailer. Morgan certainly appears to be the game’s central character and the trailer describes him as “a wanted man.” He’s an anti-hero, then, given that throughout the minute and a half reel of footage, we see him behaving a little rudely towards other characters as he robs and threatens them. From what we can tell from the trailer, Red Dead Redemption 2 seems to be a prequel given that the antagonist from Red Dead Redemption, Dutch Van der Linde, shows his face at the end and his gang is a confirmed part of the action. Other than that information is pretty thin on the ground. Visually the game looks to be on the right track as another Wild West adventure with plenty of horse riding, rugged terrain, fist fights and revolvers. Unfortunately, the trailer didn’t narrow down the game’s release date which still stands as Spring 2018 for both PS4 and Xbox One, after it was delayed earlier this year.